Researchers at Northeastern University and IBM Research have discovered a new variant of the Spectre CPU vulnerability that can be leveraged through browser-based code. An important difference between the new vulnerability known as SplitSpectre and other Spectre variants is that it is easier to exploit. 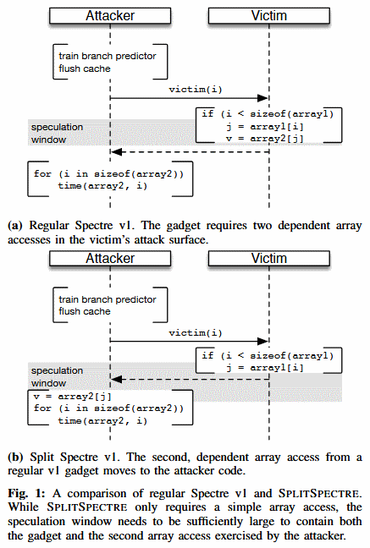 “Although Spectre v1 is powerful and does not rely on SMT (Simultaneous Multithreading), it requires […] a gadget to be present in the victim’s attack surface. Google Project Zero writes in their original blog post on Spectre v1  that they could not identify such a vulnerable code pattern in the kernel, and instead relied on eBPF (extended Berkeley Packet Filter) to place one there themselves. “All things considered, our analyses lead us to conclude that the attack is viable, and that the ability to trigger it in practice depends on the identified microarchitectural properties of individual CPU families,” researchers said. But users don’t have to worry because the existing Spectre mitigation method can also block SplitSpectre attacks. The research report was published on the IBM Research website.